Bought myself an instrument to measure needle gauge so have figured out what sizes my short double-pointed needles are. Bought the smallest size in bamboo 2.25mm too and am redoing the rib with these smaller needles for the first pair of dog mittens. 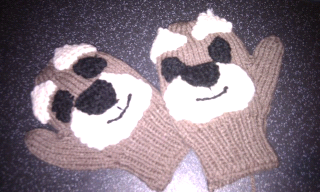 Have also made second dog pair for my daughter... haven't done the features (ears, eyes etc. yet). Feel an urge to do some snuggly winter socks now I'm becoming more proficient on 4 needles. However, after the kids mittens I am going to do a pair for myself - found 2 balls grey Debbie Bliss cashmerino dk in John Lewis. Will attempt to do slightly longer length on wrist/lower arm. 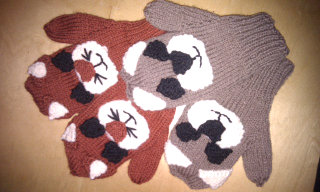 Or maybe dare to do gloves? Have a glove and mitten book purchased a long time ago that I've avoided because of not knowing how to knit in the round. Hmmm.